Volkswagen Touareg Interior, Sat Nav, Dashboard | What Car? Finding a comfortable driving position in the Touareg is very easy. Both the steering wheel and driver’s seat get plenty of adjustment to ensure that, regardless of your height, you’ll be well catered for and there’s adjustable lumbar support up front. The seat goes high enough to ensure that even short folk to see the end of the bonnet. Heated front seats are standard on all models and ventilated and massaging seats are on the options list. You may sit behind a familiar Volkswagen steering wheel, but things look very different when you cast your eyes across the dashboard. Conventional instrument dials and a sizeable 9.2in touchscreen infotainment system are standard on SEL and R-Line, but these can be replaced by a 12.0in digital display and a 15.0in touchscreen, both of which are standard on R-Line Tech. 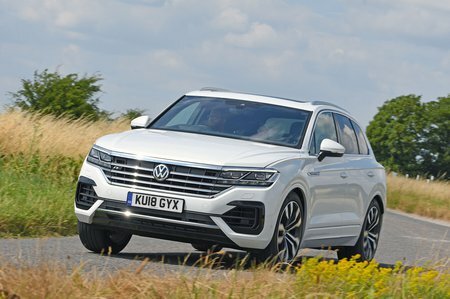 While the 12.0in digital instrument cluster isn’t too far removed from the Digital Cockpit offered in the Tiguan, Passat and other Volkswagen models, the 15.0in infotainment system is something of a brave new world. You see, Volkswagen has employed this huge high-definition TFT touchscreen to all but banish buttons from the Touareg’s dashboard. As a result, to change anything from the temperature to the colour of the optional ambient lighting means poking at the big screen – something that isn’t always simple. Yes, the air conditioning and seat heating/cooling controls may be easily accessible, but plenty of other functions require you to dive deep into menu after menu. Things aren’t helped by some of the icons being too small to accurately hit on the move. Fortunately, you can configure the home screen to show the things you use the most, in the same way as you might on a smartphone. Even so, the screen is so heavily angled towards the driver that it makes controlling the system from the passenger seat a little awkward. Thankfully, the smaller 9.2in touchscreen is surrounded by physical shortcut buttons for climate control and other key features. It does look rather less neatly integrated and visually imposing than the bigger screen, but it’s easier to use and will save you an awful lot of money. Infotainment aside, you might find some of the interior quality a disappointment. The steering wheel, gear selector and other areas you touch regularly may feel good to the touch, but your fingers don’t have to wander too far to find plastics that could have been lifted from a Golf or Tiguan. Yes, the dashboard and the tops of the doors feature plenty of squishy plastic, but the majority of materials below the steering wheel are hard, scratchy and seem out of place on something that will cost north of £50,000 in most cases. Large windows mean you get a great view out. If you need a bit more help, you can get a suite of camera systems, including one for reversing and another to help you nose out of blind junctions safely.